Michael Phelps, also known as the flying fish, just may be the greatest athlete of all time. A native of Baltimore, MD., Phelps, now 31, has competed in and won numerous gold medals in four Olympic competitions starting in 2004. He has broken world records right and left starting when he was 15. He used $1 million of his winnings to start a foundation in his name to help young swimmers and to promote a healthy lifestyle for young people. It might be added that he did all these things while being arrested twice for driving under the influence of alcohol and being photographed smoking marijuana in a bong. Phelps made public apologies for the DUI arrests. Like the rest of us, he is human. He says he has learned from his mistakes. 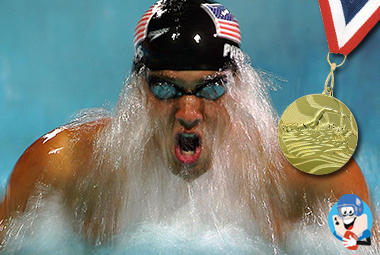 Dubbed the fastest swimmer in the world, he has won 28 Olympic medals -- 24 of them gold. He started swimming at the age of seven, found a championship coach named Bob Bowman at age 11 and developed a rigorous training program and approach to swimming that is nearly unbeatable. Hey, he watches his calorie intake and even takes post swim ice baths. Today Phelps is worth an estimated $45 million. He has a child and is engaged to marry a former Miss America. But it wasn't easy getting there. Before I forget to mention it, he is also a poker player. And he doesn't play for small stakes. Each week he buys into a $25,000 on-line game. He says he does it because he likes the game and it helps him to relax. Some of his friends and associates think poker will ruin him. They worry that it will eat away the fortune he has accumulated from his championship swimming, gold medals and commercial endorsements. That's a lot of nonsense. Poker is not a gambling game. It is a game of skill just like competitive tennis and golf and was so judged by the 9th Circuit Court of Appeals when it ruled in favor of a tournament poker player who filed a claim against the IRS when it tried to deny him his travel and other expenses in a celebrated tax case. Michael's mother is a middle school principal and his father is a retired Maryland State Trooper. His father was an outstanding football player in high school and tried out for the Washington Redskins. Phelp's parents divorced divorced when he was nine and his dad remarried. Michael has never forgiven his father for breaking up the family. In the sixth grade, doctors discovered he suffered from attention deficit hyperactivity disorder and he underwent treatment for it. 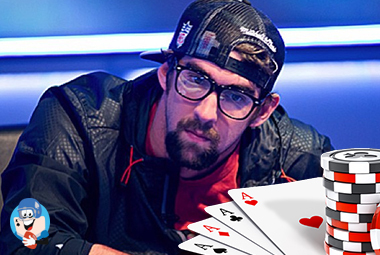 Until he and his future wife got together, Phelps shared living accommodations with a fellow poker player named Jeff Gross. They are best friends and often play poker together. Michael says he has made a lot of friends at a poker table. After his second DUI arrest, Phelps was very distraught and allowed his family and friends to talk him into undergoing rehabilitation therapy at The Meadows in Wickenburg, AZ. He remained there 45 days and completed the therapy successfully. After his success in the 2012 Olympics, Phelps announced he was retiring from swimming. He didn't stick to his retirement plans. He contacted his swimming coach before the 2016 Olympics began and wanted to go back into training. Bowman complied. Phelps performed superbly, won some more gold medals, and then retired for good. Today the golden boy has turned into the golden man. He has my best wishes for the brightest of futures. Maybe we'll hear about him again when he makes the final table at the World Series of Poker.